Saturday was spent at the fairgrounds. We got there before the gates opened and were first in line to get in. Shortly after we arrived, I went to use the restroom and when I was coming out, I managed to trip over an acorn. A lady saw me fall and immediately rushed over to see if I was okay and asked if I wanted her to get help. I let her know I was okay, just startled and a little scraped up. I scraped and bruised my knee pretty badly, but I had Band-Aids in my bag, so it was only a minor problem (and the first aid building wasn’t too far had I not brought Band-Aids with me). Mostly it just hurt really bad and looked terrible! It was a little sore to walk for a while, though not bad enough that it bothered me. I was just glad I didn’t drop my camera, which I had hanging around my neck when I fell. 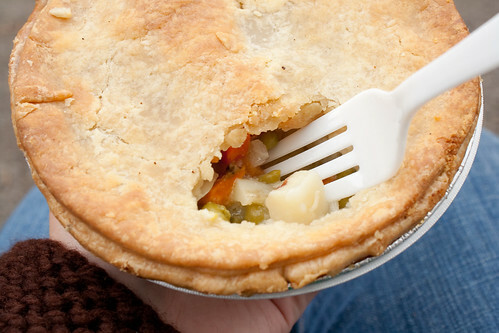 While at the fair, I made sure to try one of the chicken pot pies I’d heard lots of people rave about. I found the booth well before the long line and crowd started, which was around 10 am. I was hungry, the line was short, and I didn’t want to miss it, so I went for it! It was quite yummy and I was glad I got one when I did. Later, closer to lunch, the line was really long and I heard it was an hour or so wait. The fried artichoke line was the same way! Long line and wait. I had intended to go there early, but forgot and the line got long, so I passed on trying those. Chicken Pot Pie – YUM! Curious what the inside looks like? Click here. 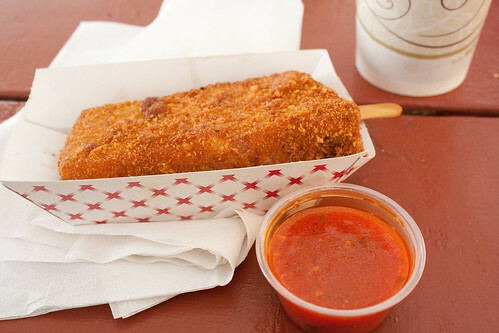 My absolute favorite food item at Rhinebeck? 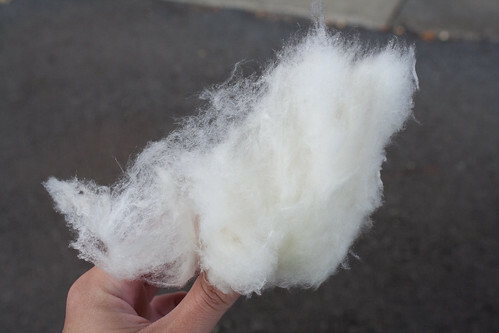 Maple cotton candy! I love maple anything and when I heard about maple cotton candy, I had to try it. I didn’t find it to be nearly as sweet as regular cotton candy (I was worried it would be) and it was deliciously maple flavored. I had to convince myself that I didn’t need to go back and buy 10 bags to take home with me. Is it fiber? Nope! Maple cotton candy. 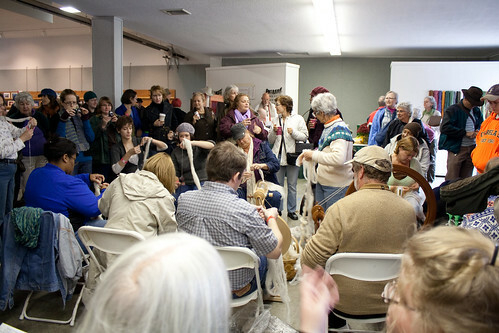 Of course there were plenty of sheep, fiber, yarn, and all sorts of things to see, try, and buy besides food. There was a spinning competition on Saturday. The goal was to spin as much as you could in 15 minutes. 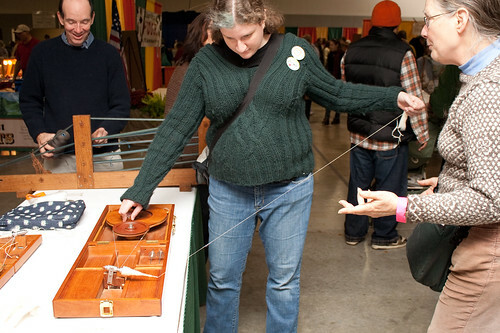 There were wheel spinners and spindlers. Not entirely sure, but I think the spindlers and wheel spinners were in separate categories (it wasn’t very clear). Two of the three wheel spinners were guys, which was a pleasant surprise. We stayed to see them finish, but left before the results came back. I saw lots of folks throughout the day, at the Ravelry Meetup and at the Ravelry Party. Many were folks I’d met in person previously (at Rhinebeck last year or the Spring Fling this year) and some were folks I knew on Plurk or Twitter or Ravelry that I finally got to see in person. Wishing I’d taken more pictures of everyone!! There were also some folks I managed to miss because I didn’t run into them or they were only going Sunday. Makes me wish that Rhinebeck lasted all month so I could see and spend time with everyone more! Soooo… what did I come home with? I was surprisingly reserved in what I decided to buy and ended up with more fiber then yarn. 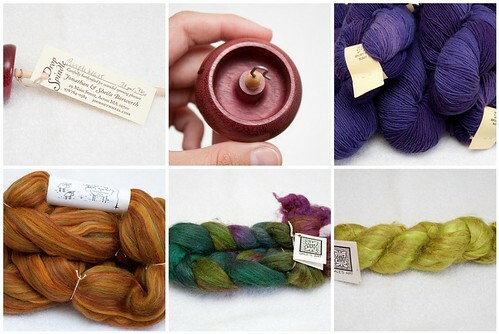 I purchased a Bosworth Mini Spindle in Purpleheart, enough yarn for a sweater from Brooks Farm in Solo, a half pound of Corriedale from The Sheep Shed and Mountain View Farm, 4 oz alpaca/silk roving and 2 oz of silk from Gale’s Art.